NOTE: As of 2019 – TotalVPN is no longer active or offering any paid of free VPN services. It’s tough selecting the VPN service for individual needs given that there are so many services to choose from. Between features, privacy policies, the location of the company’s headquarters, and a thousand other factors, it’s nigh on impossible to select an appropriate service without some previous knowledge. Instead of trying to blindly hit a bullseye, we’ve done all the heavy lifting for you to make it easier to determine if Total VPN is right for you. They are new, up and coming VPN service with a lot to offer, but we’re going to highlight both their advantages and disadvantages to give you the information you need to make a decision. Before we dig into the results of the speed test and compare their features to other services, let’s take a closer look at their payment plans. For starters, Total VPN offered competitive, and low prices on launch, but have recently updated to a promotional plan that is more in line with market prices. You can sign up and pay monthly or yearly, but the price remains the same. Instead of getting a discount, signing up for a yearly plan qualifies you at the promotional rate for the whole year, where as signing up for the monthly plan would only offer the promotional price for a single month. Price goes up to $8.49 per month on the yearly plans at the end of the first year’s billing cycle, and up to $12.49 on monthly plans. These prices are comparable to ExpressVPN, but only time will tell if they will grow large enough to be competitive. Regardless, the $5.99 promotional rate is competitive, and a good deal to take advantage of at this time. Otherwise, there are better deals out there. I would also like to point out that customers are hard pressed to find a cheaper service. As far as industry leaders are concerned, one of the only other competitors that comes close to this level of affordability is PIA VPN, whom offer a monthly rate of $3.33 with an annual subscription. If price is your main concern, Total VPN may likely be your best option. However, let’s dig a little deeper and look at the features of their service. Free Accounts are also offered, but I did not test it on its own, since it provides a stripped down version of the service, with slower transfer speeds, limited download bandwidth, and access to 3 servers, It is not a “free trial” of their full plan, and therefore cannot be used to comparatively test the paid service. Firstly, I would like to mention that the features page of their website was a little aggravating because it kept redirecting to the payment page – (but I later found out this was happening because I had already signed up for a free account). After a combination of typing in the URL manually and actually testing the service, I was able to discern the features of their product. But if you haven’t signed up for a free account, you can easily access the page. Most of their advertised features aren’t anything particularly special, but instead what VPN users have come to expect as standard. As you would expect, they boast a 99.9% uptime guarantee as well as unlimited bandwidth. They claim they have “automatic Wi-Fi security,” but in all reality, this just means that other users on the same wireless network won’t be able to intercept and read your communications because they are encrypted (which is the same for any other service). Of special interest, I was pleased to discover that they do, in fact, allow P2P file transfers across their network, so they are a good fit for Bit Torrent users. As we’ll discuss in greater detail, they do have 24/7 customer support as well. In addition, I was pleased to see that they allow up to 3 simultaneous connections per account, when the industry standard seems to be only 2 simultaneous connections (though some providers offer as many as 5). Though they lack a free trial for all servers, you can get a totally free account indefinitely, but with a limited service of 3 locations, capped speeds, and limited bandwidth. They notably offer a 30-day money back guarantee, which is the longest you’re going to find anywhere else. A lot of providers offer no money back guarantee or one that lasts 7 days. Last but not least, I would like to point out that they have a network of servers in only 30 countries. The company is still in its infancy, and I would expect them to bolster their network by adding more servers in more locations as time progresses. 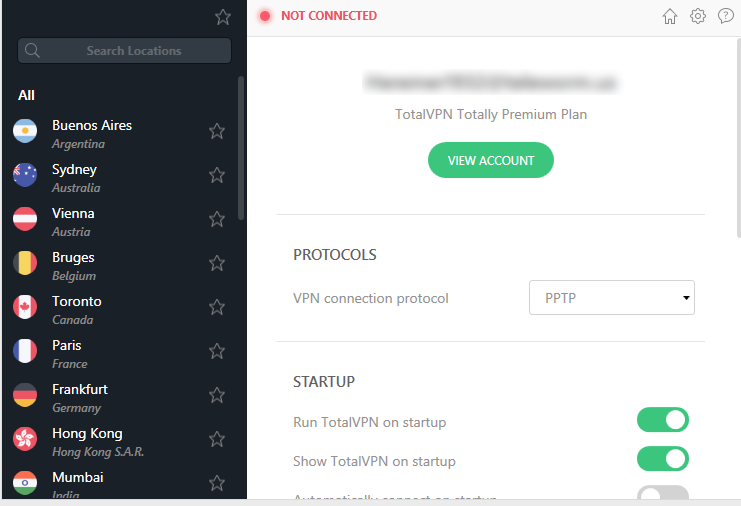 Total VPN offers three connection types: PPTP, OpenVPN, and IKEv2. I would highly recommend that users abstain from PPTP connections if they are concerned about mass data collection from agencies, since they are notoriously flawed, only offer weak encryption, and can easily be cracked. The the default connection type is PPTP, and users will have to manually change this option in the settings menu for stronger security. That said, the service is aimed at users who wish to quickly unblock streaming services and attain the best possible speeds. For those purposes, most users feel adequately protected with PPTP, as they are not overly concerned with government surveillance. Unfortunately, TotalVPN’s security did not test well at all. WebRTC IP leaks happened on all tests, and DNS leaks occured at least on 20% of the servers tested. For this reason alone, we cannot advise to use TotalVPN as a secure provider. The speed test was interesting, to say the least. To start off, I wasn’t able to make a connection to the intended destination server in Hong Kong. I’m not sure why this was, but after checking out the settings menu, I discovered that PPTP was the default connection protocol. This is terrible because PPTP only offer weak encryption, and can be easily cracked. After cycling through the different connection protocols, I still wasn’t able to make a connection to Hong Kong. I would click the button, and absolutely nothing would happen. Perhaps they were having server or capacity issues – I can’t be sure. Finally, I decided to connect to London for the speed test, and seemed to work just fine. And as disappointed as I was with the Hong Kong snafu, I have to admit that the speed test results were encouraging. We can reasonably expect some overhead to decrease the raw bandwidth and latency of my Internet connection, but Total VPN performed pretty badly. I would also point out that I can buffer YouTube videos over this connection without a hitch, and browsing the web works perfectly fine, but it shouldn’t always be needed. Between slow speeds and non-functional servers, testing was a drag. For my personal use, as long as the latency is under 200ms I’m a happy camper, though some real-time gamers may take issue with any latency above 60 or 70ms. Last but not least, I would point out that this will also impact uploads and downloads for cloud storage applications, though with a faster Internet connection most users probably won’t tell much of a difference. All in all, I was pleased with the results of the speed test with exception to not being able to connect to Hong Kong. But the bottom line is, anything above 100ms is not fast. Fast servers will provide ping responses anywhere from 10 to 30ms, a little higher is fine, but 200+ is high. Customer service is 24/7, which most VPN users have come to expect as standard. For account related inquiries and technical support, users can open a ticket by emailing them directly or using a live chat feature on their website. I tested it out and found that the queue time was only estimated to be 3 minutes, but it only took about 2 minutes before I got a response. To test the representative, I asked them questions such as which connection protocol offered the strongest security and how to change that in the software interface. So, at the end of the day, is Total VPN right for you? Well, normally I wouldn’t select a provider that is so new, but it this case new or not, it severely under-performed to the point that it could not be vouched for. Between the results of their speed test and security, they don’t pass the standards of even the most basic of needs. DNS and WebRTC IP leaks happened way too often, and that completely defeats the purpose of using a VPN in the first place. At most, stick to their free service if you really want to test them out. Otherwise, I would suggest to opt for one of many other providers available. Also, I would mention that the software interface is unbelievably simple and watered down. If you’re a nontechnical user, this could be an advantage. However, users who know their way around a VPN service may feel that they lack advanced settings, options. But missing security features such as DNS leak protection, a VPN kill-switch, and defaulting to PPTP protocols instead of OpenVPN, simply don’t cut it for today’s standards. I think there are better alternatives at comparable or better price points with more features. For example, PIA VPN only costs $3.33 per month with an annual subscription, and they allow 5 simultaneous connections per account. 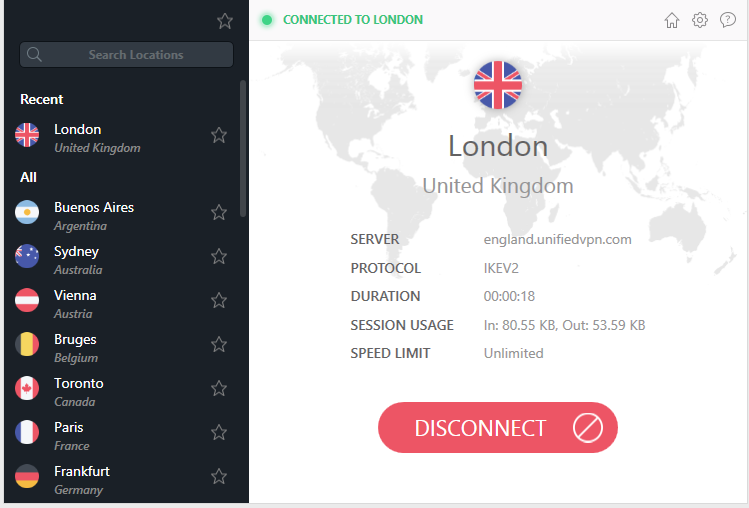 TotalVPN is a terrible service, on several counts. 1) I am in Kazakhstan and want to watch HBO boxing and Netflix. Both providers immediately discovered that I was using VPN. 2) I canceled the service on their site but they continued to charge me at $14.97, which is higher than $6.95, to which I initially subscribed. 3) When I called them, their rep said I should have received a reminder from them 15 days prior to each charge. I never received any reminders. 4) When I said I canceled the service through their web site, they said I should have canceled by email. Even the fact that after cancellation I was not able to access my account did not matter for them.